Asparagus is a crowd favorite when it comes to vegetables because its fairly easy to cook and prepare. You can buy asparagus by the bunch with each bunch usually containing about 10 to 15 stalks. Go for the ones with bright green stalks and those that are not dry or shriveled. You can buy either thick or thin stalks according to your preference. There are several ways of cooking asparagus depending on the dish you want to prepare. Prepare the asparagus for cooking. Wash them in cool running water and then trim a third of each stalk using a knife. Alternatively, you can just bend the asparagus spear so that it snaps and break at its natural breaking point (which is roughly a third from the tip). This will ensure that you get tender spears without wasting any of it. 1. For roast asparagus, pre-heat the oven to 400F. Place the asparagus on a baking tray. Drizzle with olive oil and toss the spears to make sure that they are well coated with it. Spread them across the tray evenly. Sprinkle salt and pepper according to your preference. You can also add bits of garlic over the spears. Cook the vegetables in the oven. 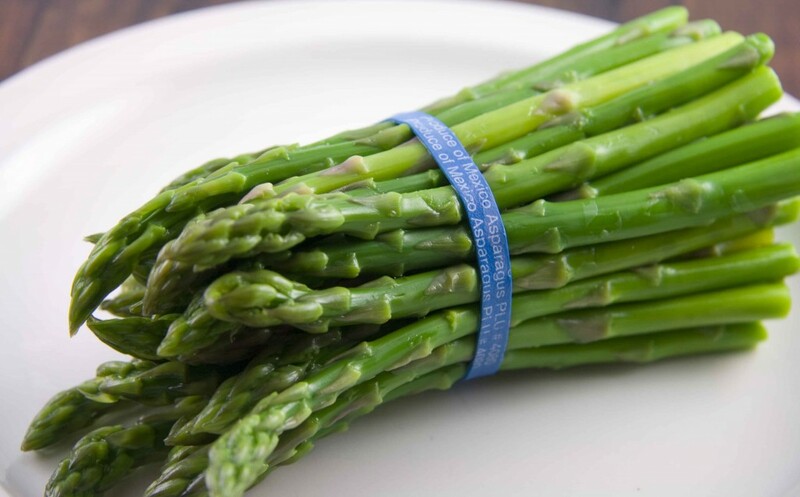 The spears require about ten to fifteen minutes to cook or until you see a bit of browning on the asparagus. If you want your spears to stay crispy, get them out of the oven once they turn a brighter shade of green. Squeeze lemon on the spears. You can also add parmesan cheese or balsamic vinaigrette. Place the asparagus stalks on a deep microwaveable dish. Add two tablespoons of water and cover with a plastic wrap. Don’t seal the wrap completely. Make sure to leave a small vent to let the steam escape. Set the microwave on high. Cook the asparagus for two and a half minutes. If you want tender vegetables, you can cook them for thirty seconds more. Remove the asparagus from the dish and transfer onto a plate. Season with salt and pepper to taste. For salads and cold dishes, you can just blanch the asparagus and then serve. This entails plunging the boiled or steamed asparagus in iced water as soon as it is cooked. This will help preserve the crispness and bright green color of the spears. Add the blanched asparagus into your favorite salad and drizzle with salad dressing. Take care not to overcook your asparagus. You want to keep them crispy. Asparagus should be used within two to three days from the time that you bought it. It’s better if you cook it on the same day that you got it from the grocer to keep it fresh. The best way to keep the spears fresh is to store them upright in a bowl of cold water. You can also wrap the ends in damp paper towel before you put them in the refrigerator.